I have a finish to share! A wee while ago, okay about 3 months ago...ahem....I started making a little Ort jar after viewing Rhona's Jar topper tutorial. Anywho, after searching the internet for some kind of ciruclar design, I decided to stitch a little flower from Nan's Threadworks pins freebie, and combined it with some lettering from a BBD chart I had lying around. Using some left over Dinky Dyes Desert Sand threads, I stitched it up rather quickly. Then I found a little Mason Jar at my local SPCA Thrift mart....and there it sat, staring at me, asking me "Finish me! Finish me!!" Today I got the guts and went for it! It was fiddly to get centered but I think it turned out swell. Take a look at my new "Ort" jar. Notice that it says "ORY"? 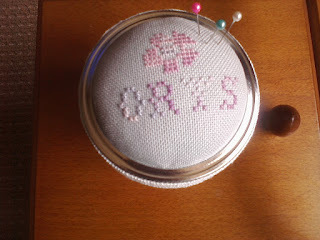 My husband pointed this out to me when I had stitched it and asked "What's an Ory?" I laughed and said "Can't you read? It says ORT!" Then I looked and felt a bit sheepish as I noticed the "T" definitely looked like a "Y". So here's my ORY jar. I had big hopes on finishing my PS summer ornament to share with you today, but that will have to wait for another day. 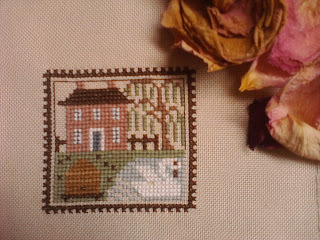 I worked hard on finishing it up this morning before this post as well as I worked on my Summer Quaker piece. Here's my PS Summer finish. Isn't it darling?!! Hmm, that start is sort of abysmal. How about you look at my fancy cracked blue vase?!! I've had it since I was 12 years old with the lavender from my Nana's garden. That vase means a lot to me as it started my blue glass obsession. When we had to move downstairs while our apartment was being renovated, and then back up, I couldn't find this vase for over a year! I actually was quite sad about it...usually loosing possessions isn't too big a deal for me...and I loose lots! But loosing this made me sad. Then one day I found it in a shoe box under our bed! I have it proudly on display now and it always holds the sweetest little posies for me. 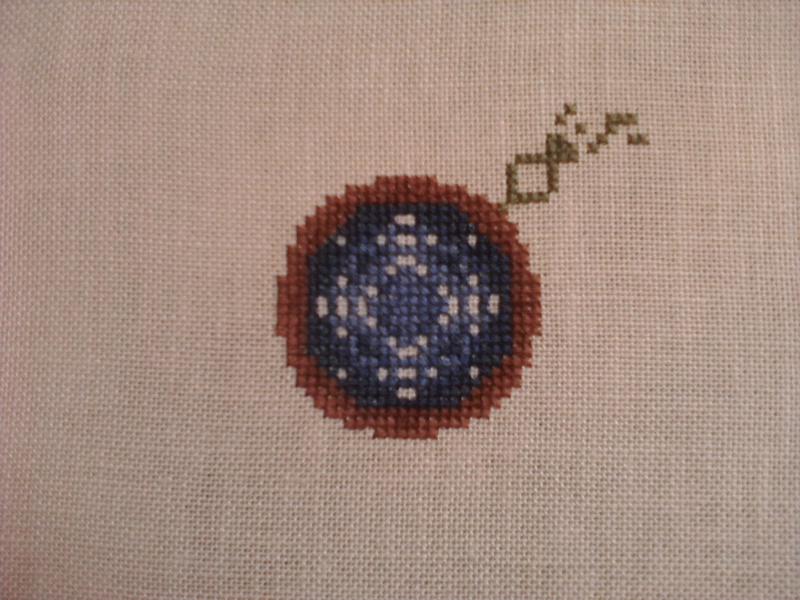 Back to stitching. Here's my By the Bay piece pictured with a shell from the Haida Gwai islands (I've never gone but a friend brought it back for me...always wanted to go there). Remember Knotgarden? Well, there's a very looooong story about why I haven't started it but I'll spare you the details (it has something to do with scroll rods, lapstands and getting irritated about having a hard time finding 27 inch scroll rods anywhere and not paying exorbitant amounts to get them). It'll get sorted out this weekend. Right, where was I. Oh yeah, Knotgarden!!! Some stash for two charts I've been wanting to start. 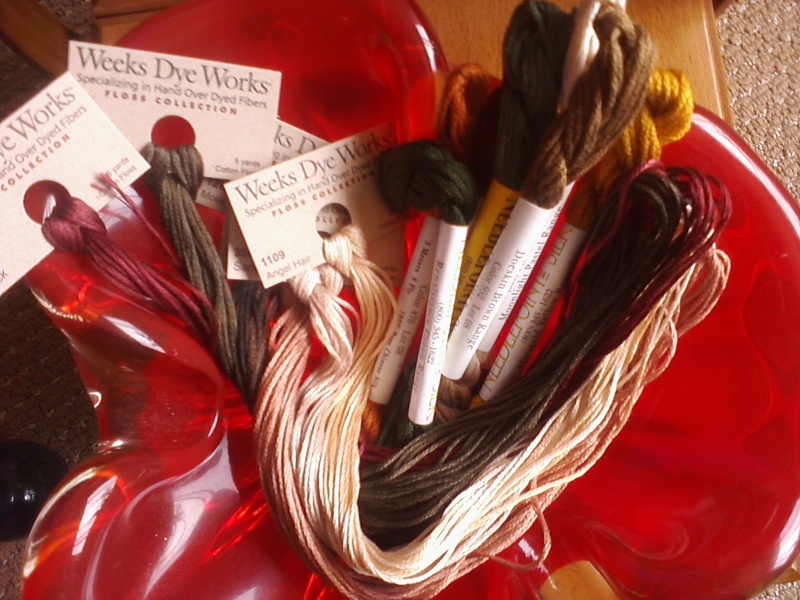 I also had some linen arrive too but I forgot to take a picture...next time! 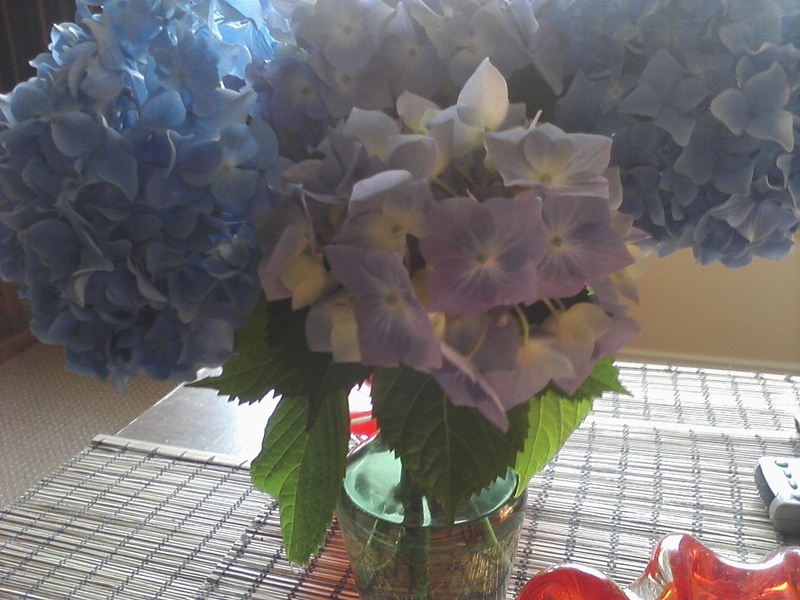 How about a pretty picture of my Nana's hydrangeas? I adore hydrangeas and hope to have some in my dream garden some day. Before I take off to do errands, I would like to welcome my new followers! Thanks for joining my blog!! Also...take a look on the left there under giveaways. Sarah from Sarah in Stitches has a lovely blog and a wonderful giveaway! Nia is having a generous giveaway too!! Take care and big hugs to all. Sorry no Titus today. I sneezed and he ran and hid under the bed. Wow! Lovely project and a great gift idea..hmmm. I'm cracking up about Titus! Is Titus as jumpy and easily startled as Mia? It sure sounds like it! lol! Anyway, love the ORT jar! It looks like a T to me too! Love the PS finish as well. I love that design! I'm glad you found your blue vase-- I really hate it when I lose things that I treasure. By the Bay looks great too, as does Knot Garden. Hope you've figured out the details on how to work on that piece! Nice new stash too! What a cute little ORY jar. Looks like you've coined a new term. It will probably go viral on the stitchy-net before you know it! I think I did that PS piece with the other seasons on a luggage tag some time ago. It's a fun design and your stitching is lovely. Of course all those PS designs have a certain similarity so this may be a different one. Hope your are enjoying summertime. Hello Anne, your ORY jar topper is so cute moreover it has a story!!! Your ORY jar looks great and I love the PS finish! Great work!! you know that vase thing.. happens here all the time! so many lovely finishes and starts! YAY! Hello Titus!♥ Your ORY jar had me intrigued. Then I laughed. :) PS summer looks perfect. The flowers and blue vase are so cute. Being cracked just give it character. Sure I'm 'cracked' and it just make me that much fun-er lol! Really though, I'm glad you found it. There is nothing worse than loosing something that has sentimental value. 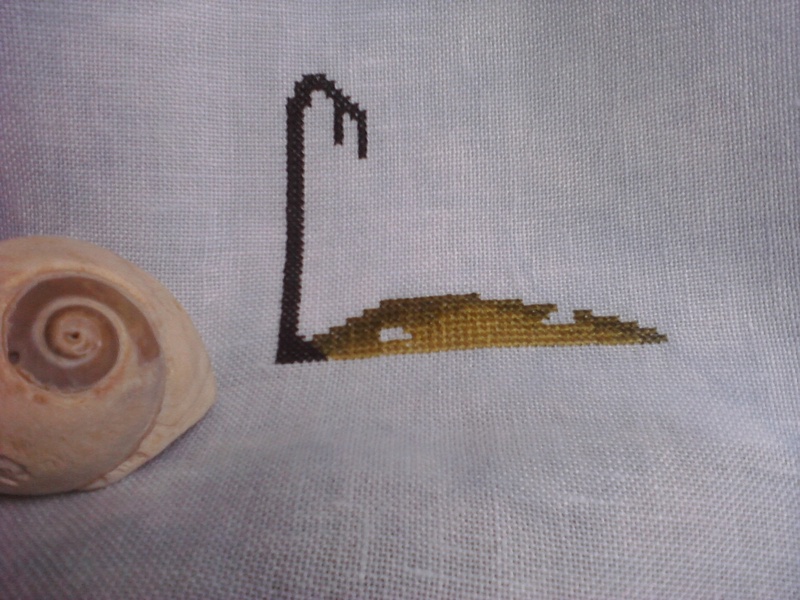 Happy Stitching and tell Titus he absolutely needs to make an appearance for the next post! Cute ORY jar, Anne! I like the PS stitch too. You've been busy with stitching I see! 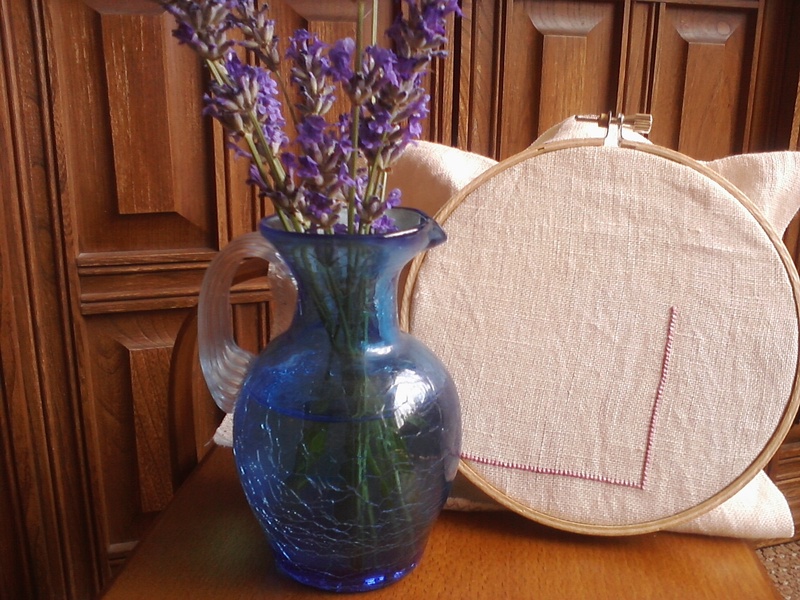 It looks to be a cool day out today so maybe more stitching to be had? I plan to! Congrats on your adorable finish! Love your orts jar! Isn't that just like a husband to say something like that?! Mine would do the very same. LOL! Looks great! Oh I see a 'T' and it was a lovely idea to decorate a majon jar! PS Summer looks darling, I agree! !I'm curious to see the next!! You've sure been busy! Great job on the ort job yup it looks like a Y to me too! Love your ORY jar....that's just the sort of thing my hubby would say too! Love all your pics in this post - wonderful! Hope Titus gets brave and comes out from under the bed! Love the cute litle "ORY" jar. Glad you found you blue glass vase, it is lovely. Love your Ory Jar! I hope you keep calling it that! Your blue vase is precious! 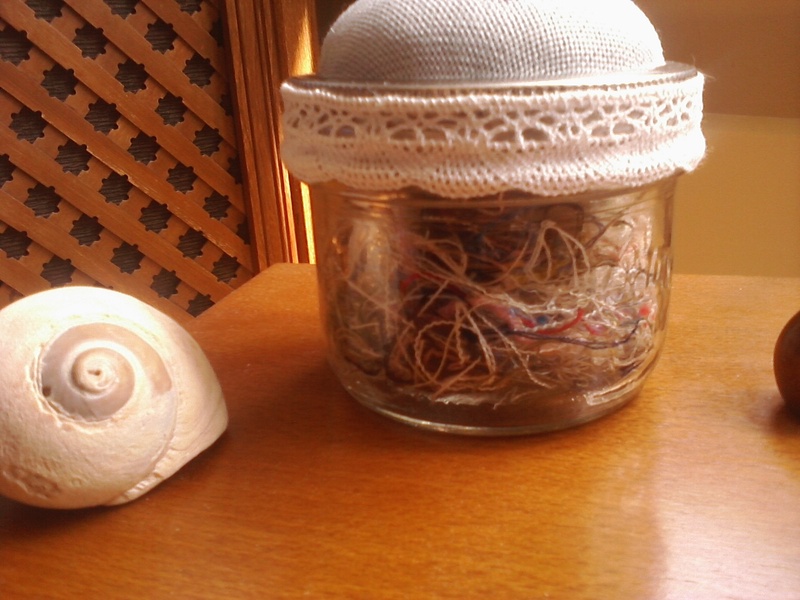 Beautiful "Orys" jar you've made :P That lace on the side is just lovely. The summer finish is darling alright. Love your "Ory" jar Anne! The PS finish is lovely and your blue vase is so pretty. An ORY jar, not something that everyone has, lol. It's special, so keep it! 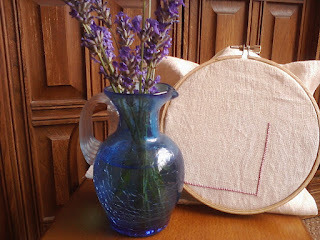 Love allot your stitchy projects ~ especially your "Ory" jar!! I have that same but vase from when I was little!! Love your 'Ory' jar, it gave me a nice little laugh this morning. 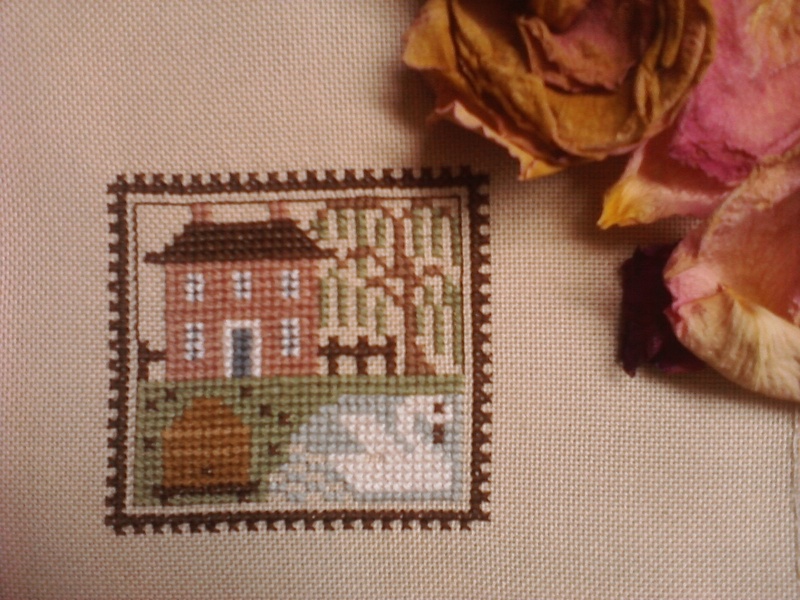 Pretty stitching. Wonderful ORY jar!!! I'd love to make it for my ort jar too. I am an elementary school teacher married to a wonderful man. I love to stitch, read, ride bikes, dance, play music, drink copious amounts of coffee and enjoy life. 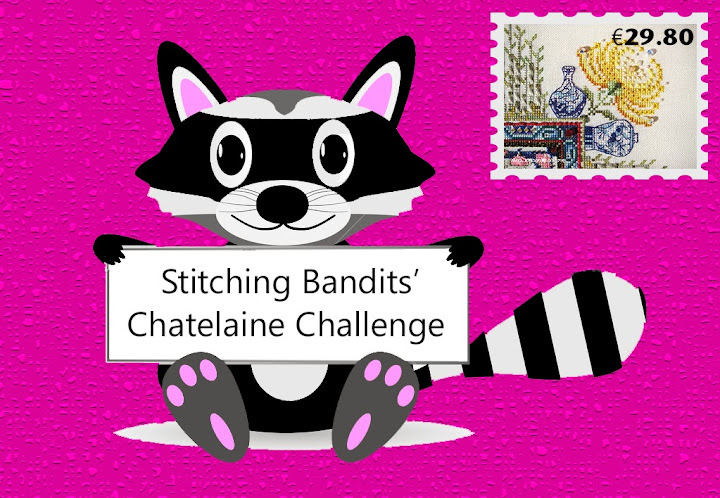 I started this blog to encourage myself to finish projects that I started stitching years ago, to expand my stitching horizons and to meet fellow stitchers like me! WOW How long has it been?!! One Year! Tanglewood Framed! Happy Canada Day!! Doll's Musings. Theme images by Jason Morrow. Powered by Blogger.